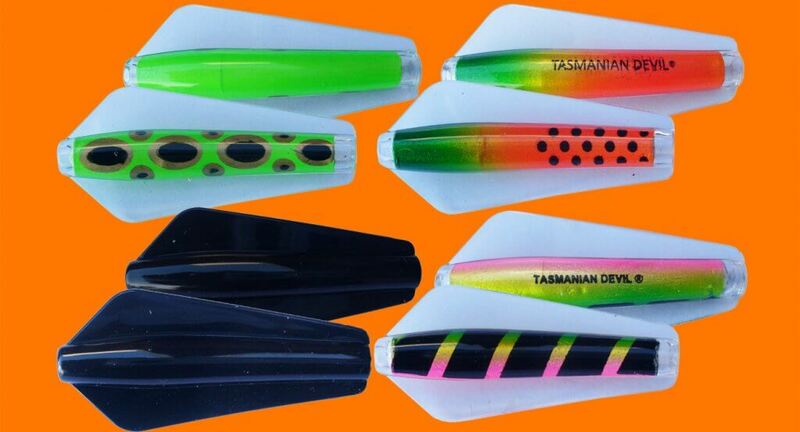 Tasmanian Devil lures are a unique Australian product designed for trolling, casting or jigging in fresh and saltwater. They are now available in four new colours – watermelon pearl (132), lime frog (133), liquorice allsort (134) and black betty (135). The first three colours are available in 7g, 13.5g and 20g sizes, and the black betty colour is available in 7g, 13.5g, 20g and 26g. The lure action is due to the winged technology that causes the lure to swim in an irregular manner, darting and diving, simulating the movement of wounded fish. This pulsating action is transmitted to the rod tip that will show as a ‘nodding action’ that is proof that the lure is swimming correctly. If this rod tip action is not present, you’ll know you’ve picked up either a piece of weed or a fish. All four sizes of the Tasmanian Devil swim in this erratic manner, and this is the reason these lures are so effective.